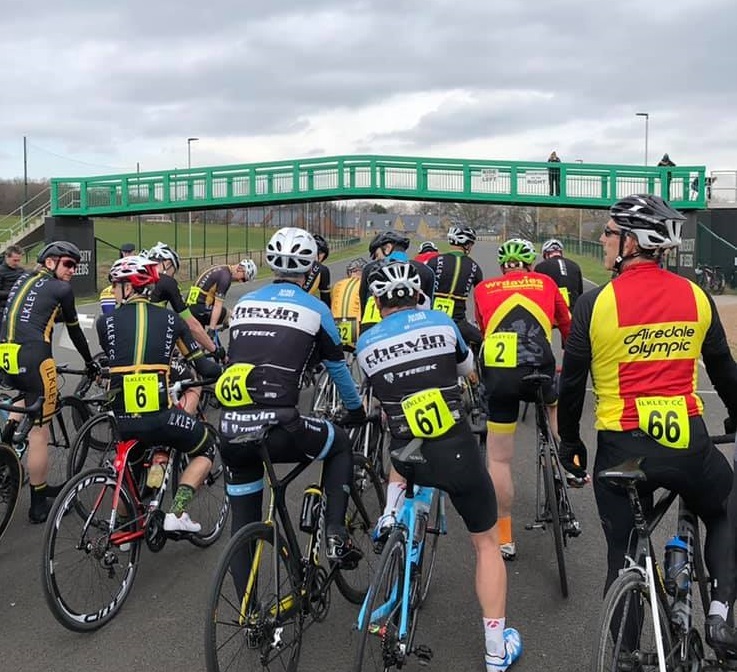 Happy to get my 2019 race season underway last month in Leeds at the Bodington cycle circuit which is part of the excellent Brownlee Centre. The complex was created by a partnership of British Triathlon, British Cycling, Sport England, UK Sport and Leeds University and the facility is named after the well know Brownlee brothers, two of the UKs leading triathletes who both attended Leeds University. It was my first time racing at the Brownlee and although I had heard good reports about it I wasn't really sure what to expect. Turns out the Bodington is a great circuit and I really enjoyed myself. From the pictures and a video that I had seen it looked like the circuit might be a bit dull with two parallel straights only a few metres apart but its actually great fun to race on. From the start it drags up for a couple of hundred metres before swinging left around a small loop, you then descend down to a similar sized left hand loop at the bottom of the circuit, it's quite long, its quite fast and after a few times up the drag its quite tough. 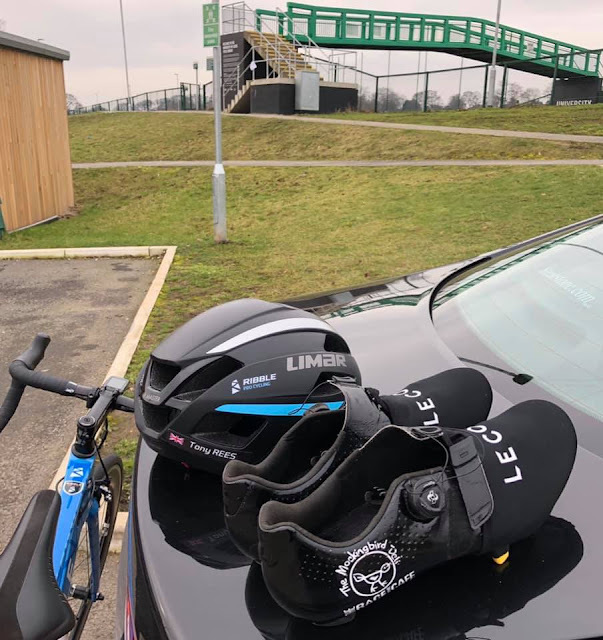 Leeds was my first chance to try some of the kit I am using this year, in the picture above my custom Team Ribble Limar Airmaster helmet which is excellent. I am wearing Giro shoes again but this pair have been custom painted for me with the blog name and the logo of my favourite cafe The Mockingbird Deli (seemed appropriate) by my friend Charlotte Jarpz, (@jarpz_ on Instagram) If you have an idea for a custom design get in touch with Charlotte HERE jarpz.com - she can literally paint anything ! Photographic proof from my mate @darrenmoody of me doing a turn ! The race was run as handicap with three groups starting separately Cs and Ds (50-60 year old's) first followed by As and Bs (40 to 50 year old's) with the Es and Fs (my group) of the oldest 60 + riders starting last but as the leaders on the circuit, a good formula which resulted in a cracking race. Turns out my legs were decent on the day and I was even tempted to put my beard in the wind once or twice, some of us old codgers did most of the race with a group of very strong C and D riders which made it a pretty hard workout. 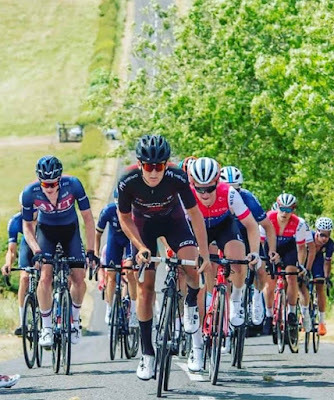 I was happy to get my first race of 2019 done and to be competitive in the old boys group, a promising start to the season after a difficult few weeks. Next stop Lanzarote and after three fifteen hour training weeks with a fair bit more intensity than I would normally do my plan was for a recovery week of about nine hours over six days. 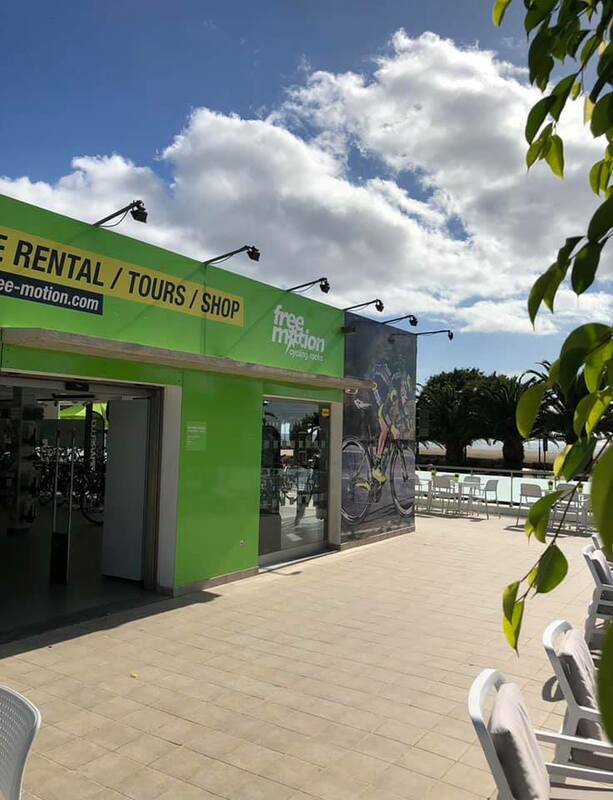 I had a hire bike booked from the Free-Motion bike centre in Puerto del Carmen, definitely not the cheapest hire option in the resort but I have used them before the bikes are spot on and their customer service is excellent. 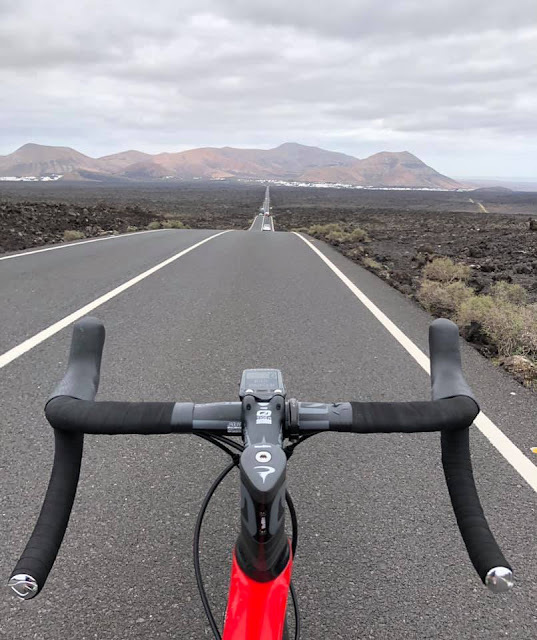 First ride from the hire shop was a gentle pedal along the cycle path between Puerto del Carmen and the Lanzarote capital Arecife. 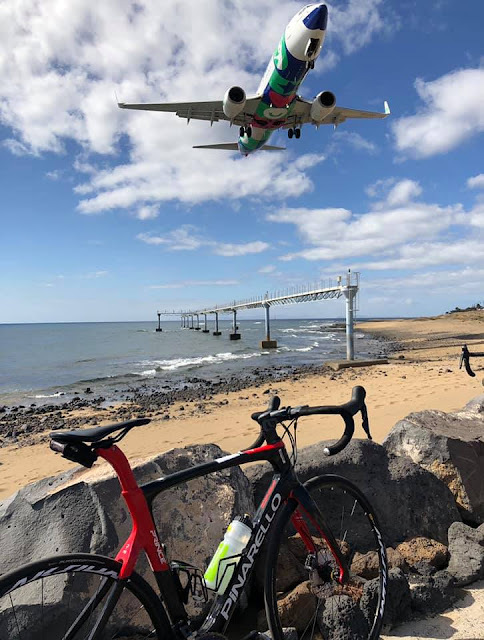 The path runs alongside the airport runway and I was lucky as I passed that I was in the right place at the right time for a good Instagram picture. I usually hire a fairly basic BH bike when in Lanza but when I went to pick it up it was fitted with FSA cranks so my Shimano crank arm with my 4iiii.com power meter fitted wasn't compatible. Upgrade it was then to a disc brake equipped Pinarello Prince with Ultegra mechanical groupset and Mavic wheels and I have to say it was it was absolutely terrific. I have never been a particular fan of Italian race bikes but this was a fabulous ride although I know that purists will disapprove that it was Shimano equipped rather than Campagnolo - didn't bother me at all as it was set up perfectly. One of my usual rides when I am in Lanzarote is the climb up to the Timanfaya volcano through the lava fields, then back down towards the small town of Tiaz (above in the distance) This is a fast descent and I picked up a lot of speed on the Pinarello and despite a fairly strong and gusty crosswind the Prince was super stable and gave even a fairly cautious descender like me a lot of confidence, see my post on a previous visit to Lanzarote here Lanza bicycle practice. Its 10.30 AM in Lanza and I promise that's a diet coke - not a pint of Guinness. 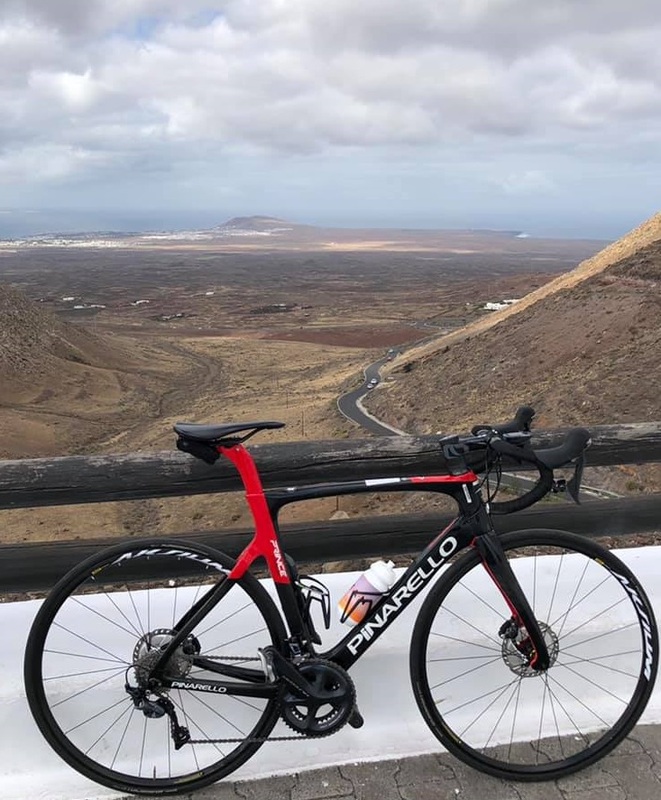 Even though I was on a rest week surprisingly I only did one 'cafe' ride while I was in Lanza which is a record for me and is what happens when you take your power meter on holiday. I did some race specific efforts on three of the days and in the process picked up a few Strava PRs on segments that I have ridden fifteen or more times (My Strava) I either go quite well on San Miguel and sangria or the Pinarello made a difference, might be a bit of both. 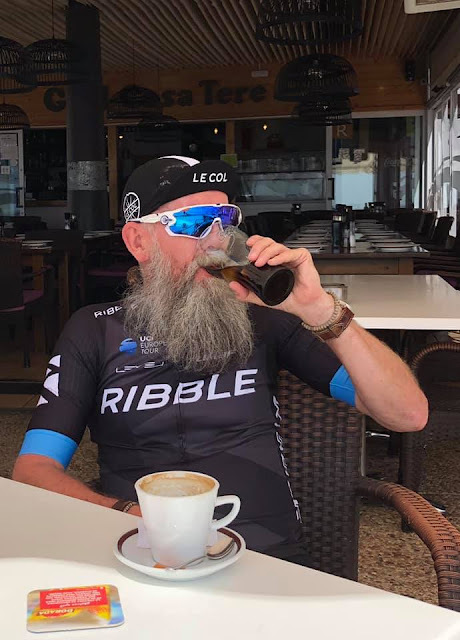 My 2019 Team Ribble kit from Le Col (above) arrived just in time for Lanzarote and very nice it is too ... and everything fits perfectly - result ! Back home now for a few more weeks of training as my next race isn't until 21st April. Following a spell of illness in January which set me back a bit (see my post here Training with Power #2) I decided to start my season a little bit later this year. I have a full campaign of thirty races planned and the late start makes sense because the TLI and LVRC road race championships are in late August and early September. I am racing on my Ribble Aero 883 again but with a wheel upgrade, I've only done a few rides on these Zipp 404's and apart from looking great I can already tell they are fast. Thanks for reading, enjoy your riding this summer and good luck if your racing in 2019. 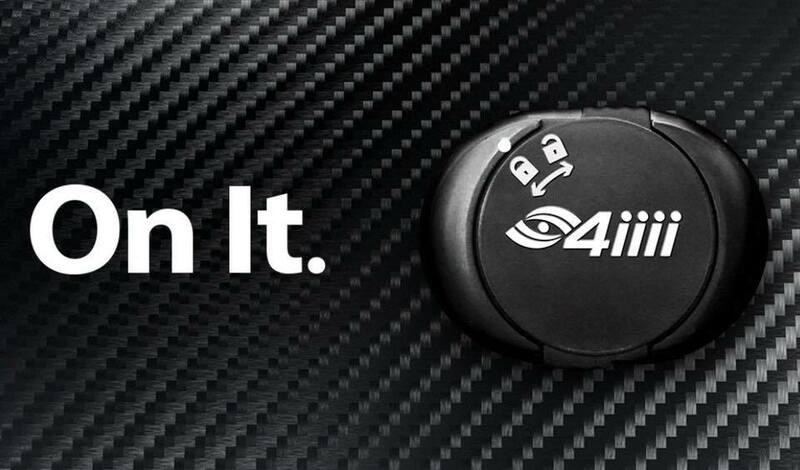 I have been using the 4iiii power meter now since the beginning of November so with three months worth of data and a bit of training with power experience now is probably a good time time for a bit of a review of how it has gone and what I have learned. When I say three months training with the power meter it's actually a bit less as I was forced to take an unplanned break at the beginning of January due to illness, but returning to fitness afterwards turned in to a learning experience in itself, so there is always positive - more on that later. 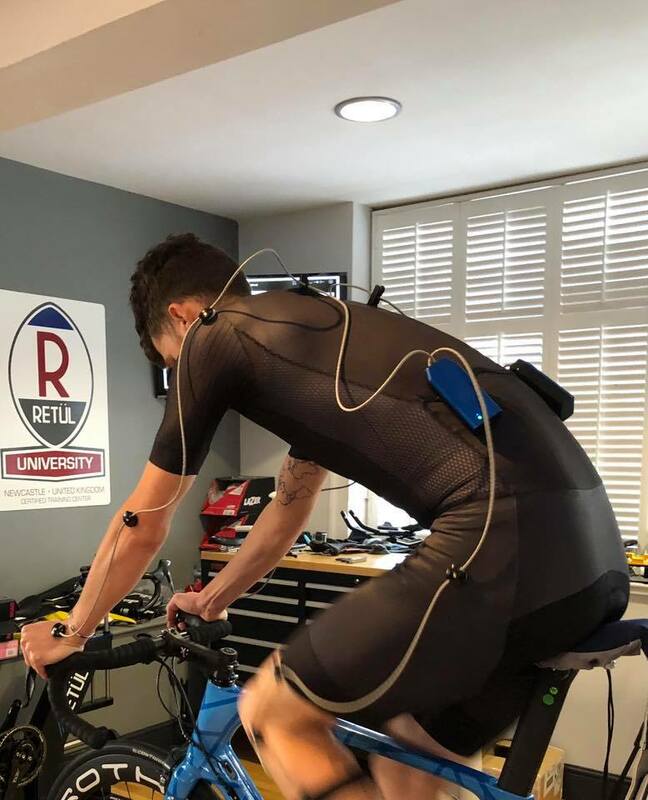 Probably the biggest benefit for me so far is that having the power meter has provided me with access to accurate, detailed and reliable training data that has not been available to me in the past. 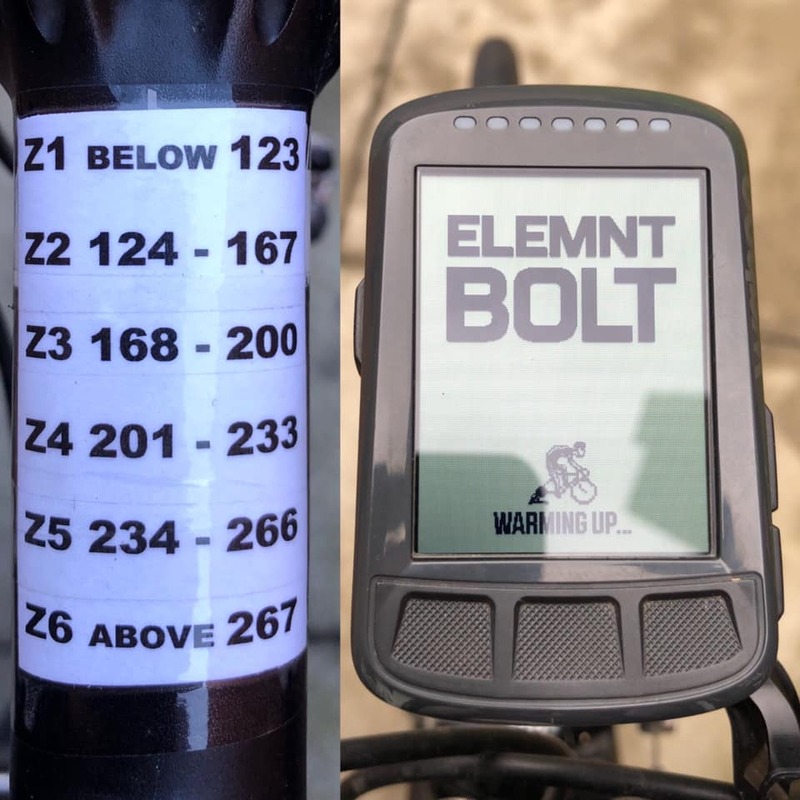 I have been using the 4iiii power meter paired with a Wahoo Elemnt Bolt head unit which is synced to upload automatically to Training Peaks TP and the information that this combination has given me access to has been a bit of a revelation to be honest. So what has changed ? 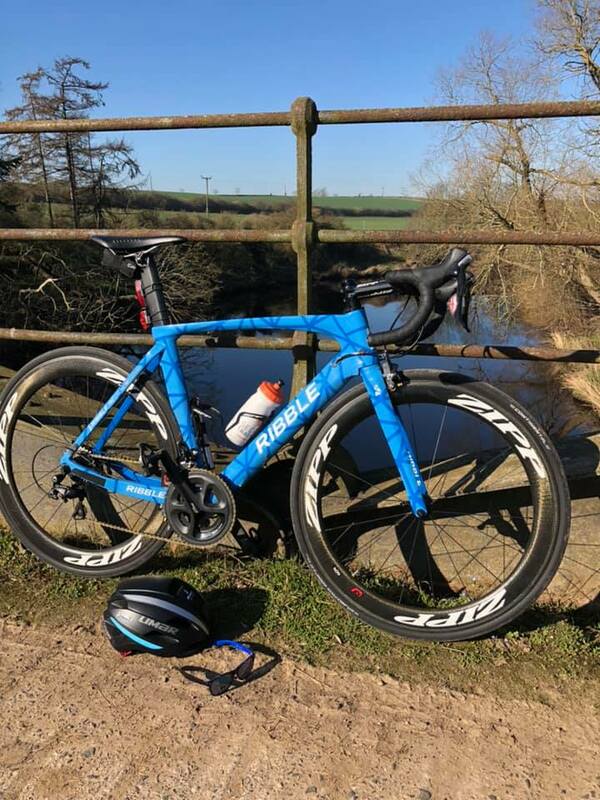 Well perhaps surprisingly I haven't really become obsessed with the watts that I am producing at any given time, or with my training zones, although I do have them taped to my stem (above) as I'm afraid my memories not what it was ... er where was I ? - oh yes I remember, what has become a key focus is my TSS (Training Stress Score) this is a really useful metric that makes planning and reviewing training much more precise and less a matter of guess work. I now know exactly how much training stress a particular effort, training session or ride induces and as a result I can make sure that my big training weeks are in fact big in terms of TSS but conversely and of equal importance that my recovery days or recovery weeks are what I think they are with the TSS quantified to ensure that I am getting the intended benefit. NOTE: Training Stress Score is a composite number calculated by taking in to account the duration and intensity of the training undertaken and is an estimate of of the overall training load and subsequent physiological stress created. To quantify that, one hour at functional threshold power (FTP) which is 95% of your best power output for 20 minutes is equal to 100 TSS points. One of the things I like most about the Elemnt Bolt is that it is really easy to use, in part because it's set it up using a smart phone app so there is no scrolling up and down endlessly with the little buttons on the side as with some other computers, not mentioning any particular brand ... Garmin. 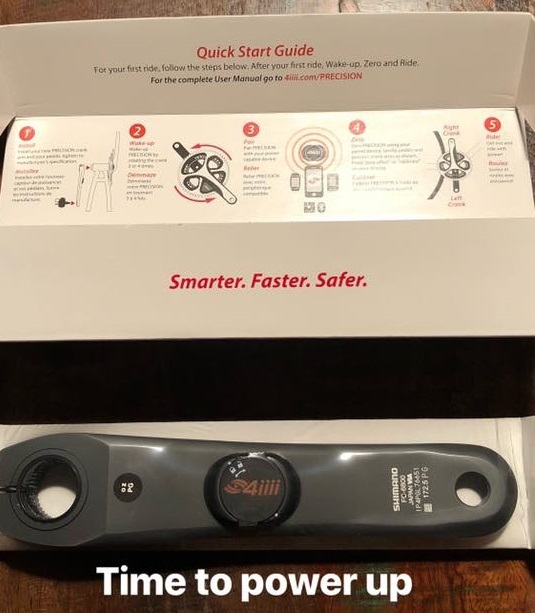 As with a lot a of devices these days you don't receive an instruction manual with the Wahoo but with this bit of kit even I didn't need a manual, which is a first. 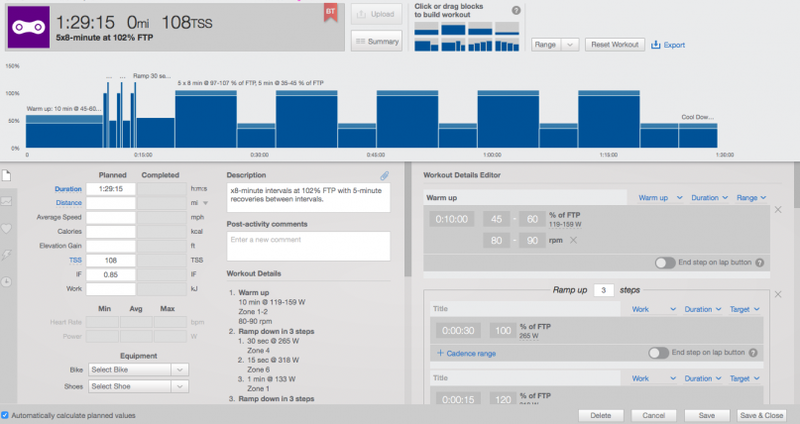 The app enables you to customise the pages just as you want them and enter your training zones etc, very very easily. As I mentioned at the top of this post I picked up a virus in January which completely knocked me out and resulted in me not touching the bike for fourteen days (another first) and even when I started riding again it was a further 10 days before I was training 'properly'. This was less than ideal in terms of preparation for the new season but I had trained really well in the final three months of 2018 so I felt as if I was probably slightly ahead of where I needed to be. That said taking a fortnight off the bike at anytime results in a significant drop in fitness and just how much difference it makes can be seen on the chart below. The is my Performance Management Chart on Training Peaks one of the features that I pay a lot of attention to especially in this post illness period. This chart shows my training from the beginning of November to today. The first significant thing to notice is the series of red dots at the bottom of the chart right of centre, these are the fourteen consecutive days off the bike I was forced to take at the beginning of January. What is also pretty obvious is the sharp drop in the PINK line which represents my Acute Training Load (ATL) or simply put my level of FATIGUE. The BLUE line which also declines fairly rapidly is Chronic Training Load (CTL) essentially this is my FITNESS. The final and rapidly rising ORANGE line is Training Stress Balance (TSB) or my FORM which is best thought of as my race readiness and is calculated by subtracting yesterdays fatigue from yesterdays fitness. If TSB is a negative number the bigger it is the more fatigue I have so as the TSB line rises sharply I shed all of the fatigue (because I am not training) but unfortunately any form I had goes with it. On the graph my TSB goes to +54 which is a big number and this is not good, to put that figure in perspective when I had good form just before Christmas my TSB was in the range -5 to +5. Take home message from the chart for me is that having being unable to ride for two weeks it will take me five to six weeks of structured training to get back to where I was before my illness, further confirmation, if any were needed that consistency is key ! I have found that in the last few weeks monitoring a rising TSS line has been a really good motivator to get out and train properly and not just mince about riding to the cafe. Having race specific structured efforts to do during a ride has a big impact on TSS and on fitness ... not too surprisingly. 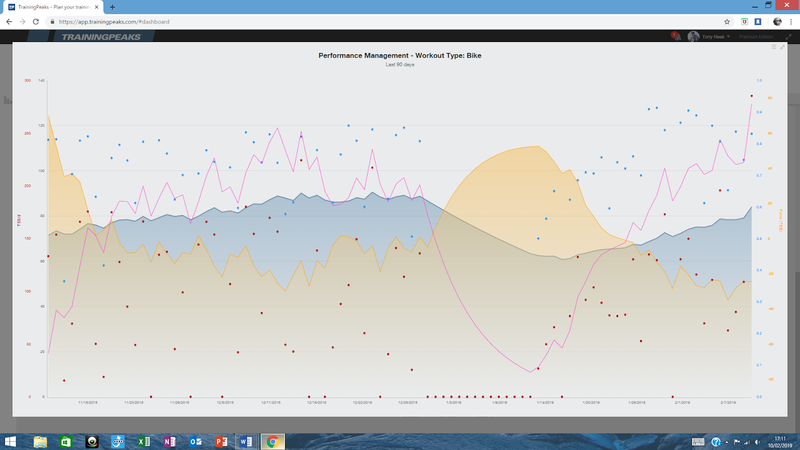 Two other metrics that Training Peaks provides that I have found myself looking at after almost every ride are my normalised power (NP) and the intensity factor (IF) for the ride. NP is calculated using a fairly complex algorithm but in essence it accounts for the variation in effort for a particular ride. If a ride contains a lot of climbing or high intensity efforts the NP will be higher than on a more evenly paced ride when the normalised power will be fairly close to the average power, NP is then another way of quantifying training stress. 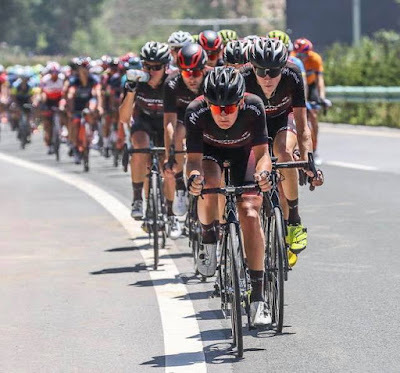 Related to NP is the intensity factor (IF) of the ride which is used to calculate TSS and is the ratio between NP and FTP and provides a number which represents a relative intensity based on my threshold power. There ... simple ? if at this point if you are suffering from abbreviation overload, my apologies, pause, take a deep breath and try to read those three paragraphs again. A great feature that is available by combining 4iiii with Wahoo and Training Peaks is the Work Out Builder. 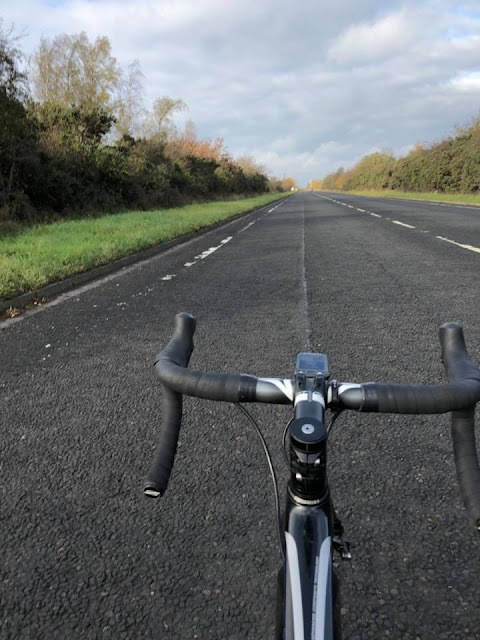 It's not too often that I have to train alone, I am pretty lucky in that I have good people to train with who are usually doing structured sessions with specific efforts tailored towards road races and crits. This gives me the luxury of not having to think too much about what to do on any given day I just turn up at the allotted time and do whatever they are doing, or at least a version of it. On the odd occasion when I know I will be training solo Jack (son/coach) who has access to my Training Peaks adds a session which I can download to my Wahoo (above) and I can follow the specifics of the session on the head unit display ... whatever will they think of next ? If you read my first post on Training with Power you might just remember that I did a series of tests over three consecutive days of 1 minute, 5 minutes and 20 minutes to establish my functional threshold power (FTP) and to set my power training zones. I did these tests at the beginning of November when I was feeling good and I was happy with how the testing went, my 5 min power came out at 235 watts which I felt was about right. I took the picture below on 25th November, just over three weeks after my initial testing. This was a training ride with some of the boys from Team Ribble who were planning a hilly four hours over the North Yorkshire Moors. 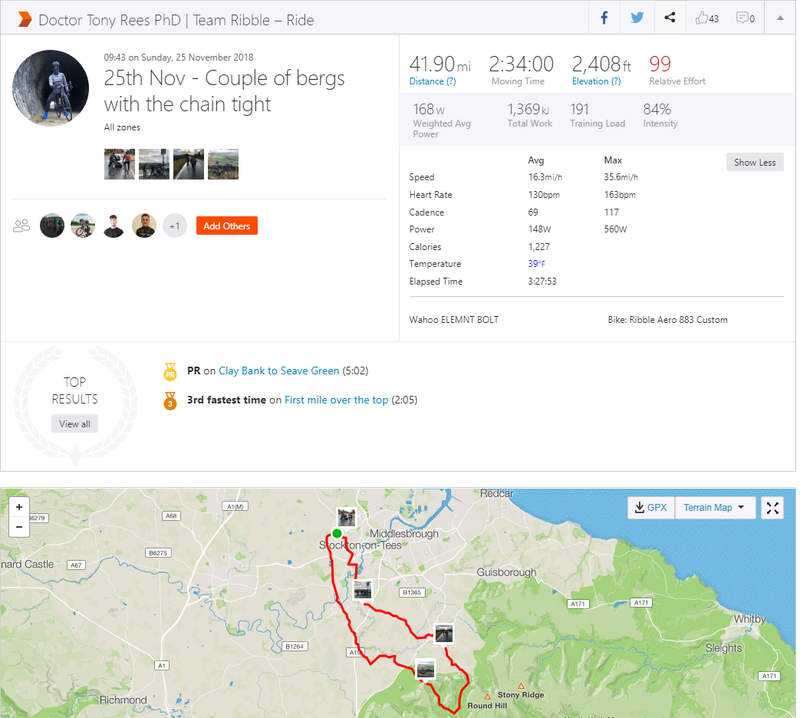 Although I was going quite well at the time it was not really a ride for me so my plan was to stick with them for as long as I could, hoping to hang on at the back until the top of the first significant climb Clay Bank. We are heading for the hills and looking at the rain clouds in the distance I was quite relieved that I didn't have four hours to do like the boys. Pictured on the right having just put his rain jacket on Ben Hetherington full time rider with Memil Pro Cycling who I featured on the blog in December BenH in front of Ben is Richard Jones (Team Ribble) another good friend who also happens to be the man behind the innovative Tyrekey, on his left Joe Wilson a super strong Team Ribble junior and on Joe's left Jack, Team Ribble founder. I have previously posted on Jack's approach to training HERE How Elites Train and HERE Polarised Training. Also present and at the front of the group but not visible in this pic Scott Auld a talented local rider who I have known for years who joins the team this year having spent the last few seasons racing in Europe. Yep the chain was tight going up Clay Bank for sure. 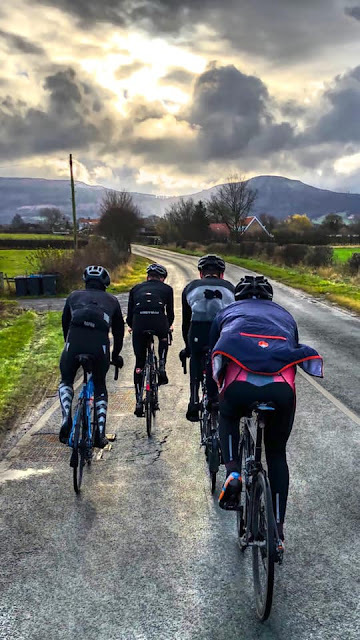 As we hit the bottom of the climb the pace started to pick up as one of the nice young men at the front (knob head) decided that a little bit of half wheeling was in order. The speed went up rapidly but not as rapidly as my heart rate, I wasn't really paying much attention to my watts as I was too focused on the fact that well before the halfway point I was on 98% of my max HR. The inevitable happened soon after, I popped and watched the boys ride away in to the distance, at least it meant I could stop at the car park at the top to recover and take a picture for Instagram - silver lining. Can't remember what happened to my bottle ? maybe I threw it a someone ? So what's this little tale leading to ? 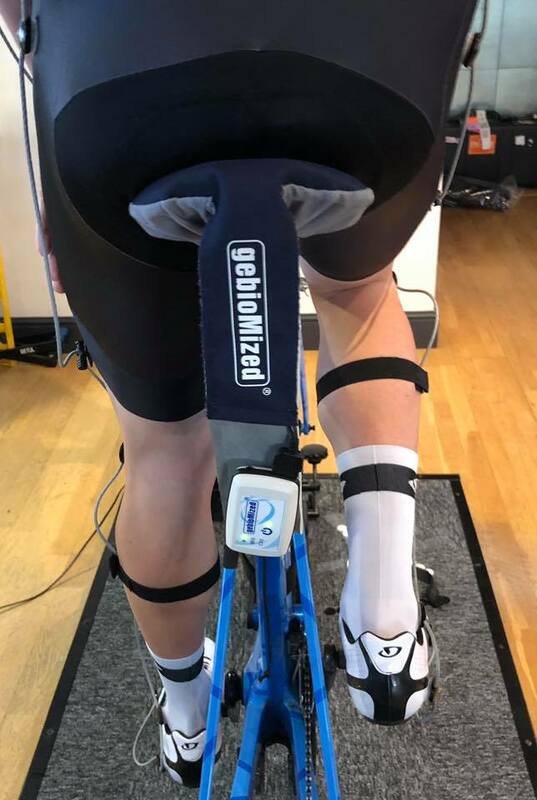 well on the climb up Clay Bank trying desperately to hold on to the group I actually produced 251 watts for five minutes which is 16 watts more than I did when I tested three weeks earlier a 7% improvement in my power output in just three weeks, absolutely brilliant ! and without really changing my training - result ! ... or was it ? well unfortunately, probably not. 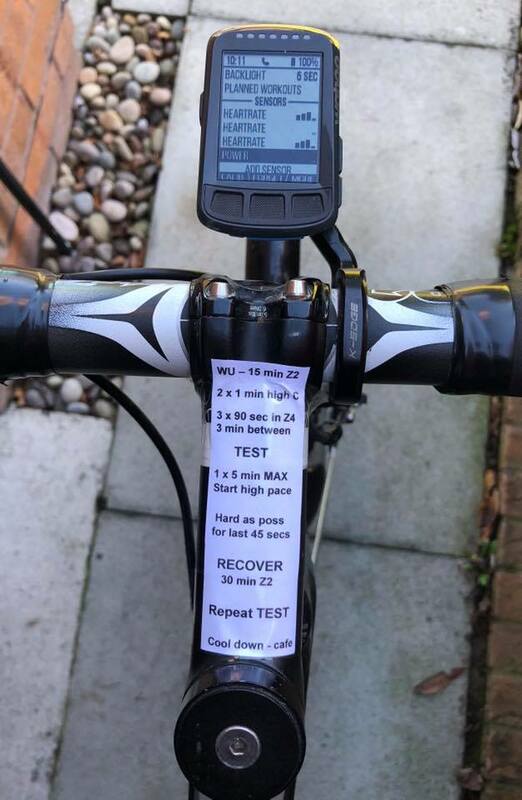 I already had those extra watts I just hadn't managed to access them when I did my testing. A more likely explanation for my improved five minute performance that day was a due to something called social facilitation. It was way back in 1898 that an American psychologist at the University of Indiana called Norman Triplett noticed that cyclists who achieved the fastest times (according to the world records of the day) did so when they were in the company of others and the slowest times were achieved by those riding alone, against the clock. Triplett went on to conduct a series of experiments to define the effects of what is now called social facilitation. Further research since Triplett's early discovery has established that its not just the presence of others that is important for social facilitation to occur but the apprehension about being evaluated by them, it basically means that when you are racing against someone else or in front of an audience you are able to tap in to energy that would otherwise not be available. This is useful and it partly explains why I can generally do reasonably OK in road races but why I have always been absolutely rubbish at time trials, obviously the fact that there is nowhere to hide in a TT might be a factor too ? 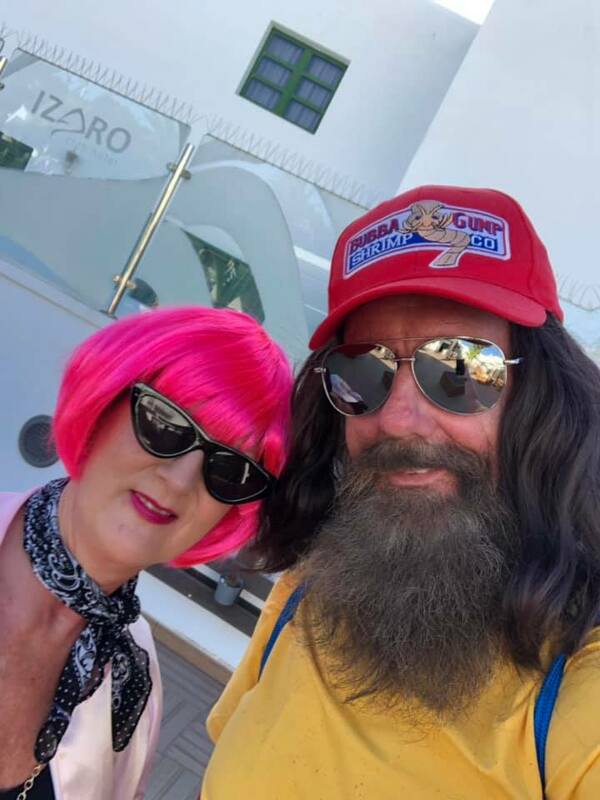 That said any race in which I can't get my hairy face out of the wind and have 'sit in' is in my humble opinion an ill conceived format ... just saying. 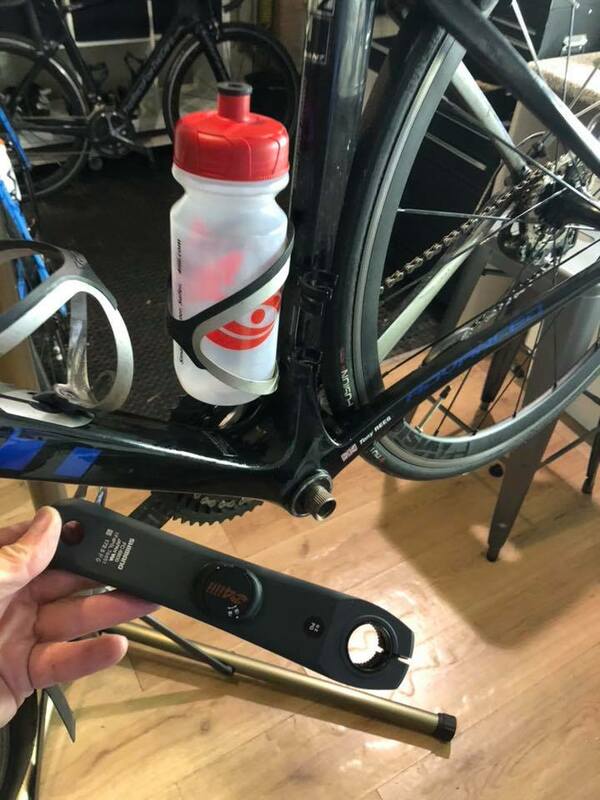 In all seriousness though, this is a really valuable bit of knowledge that I wouldn't have had without training with the power meter. It means that this season when a really hard five minute effort is required at a crucial moment in a race and I am on the limit I will be using my Clay Bank watts as a guide and not the watts that I did in my initial test, that is of course unless I test higher before the race season starts ! 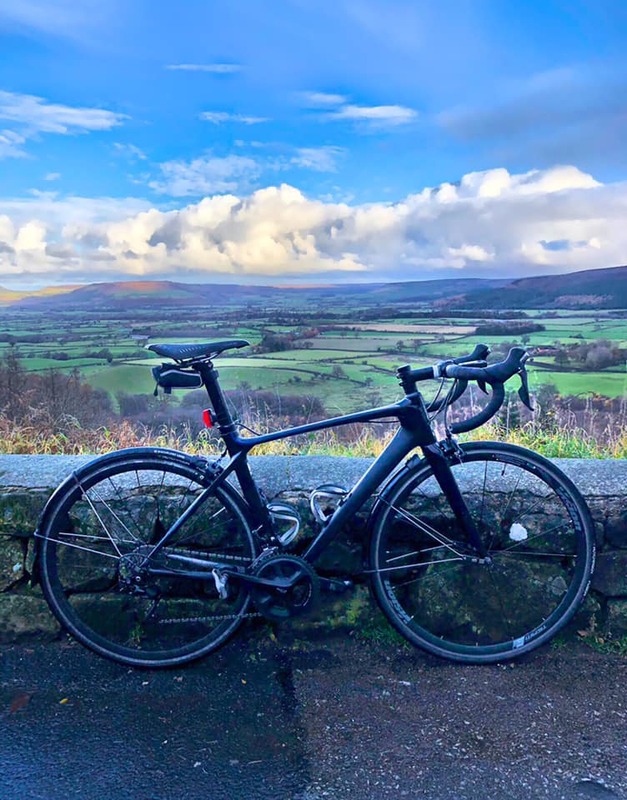 Thanks for reading and please pop back as I have some good stuff coming up in the next few weeks, including a post on my first experience of the cycling phenomenon that is Zwift ... admit it, you know you want to try it too ! Cast your mind back to the summer, remember those glorious months when we hardly ever needed to wear our arm warmers or wash our bikes. Up here in the north east one of the highlights of our cycling summer was the National Road Race Championships in July held on a circuit around Stamfordham in Northumberland and what an event it was. Brilliant weather, a great circuit, big crowds and a well deserved win for Connor Swift of Madison Genesis. 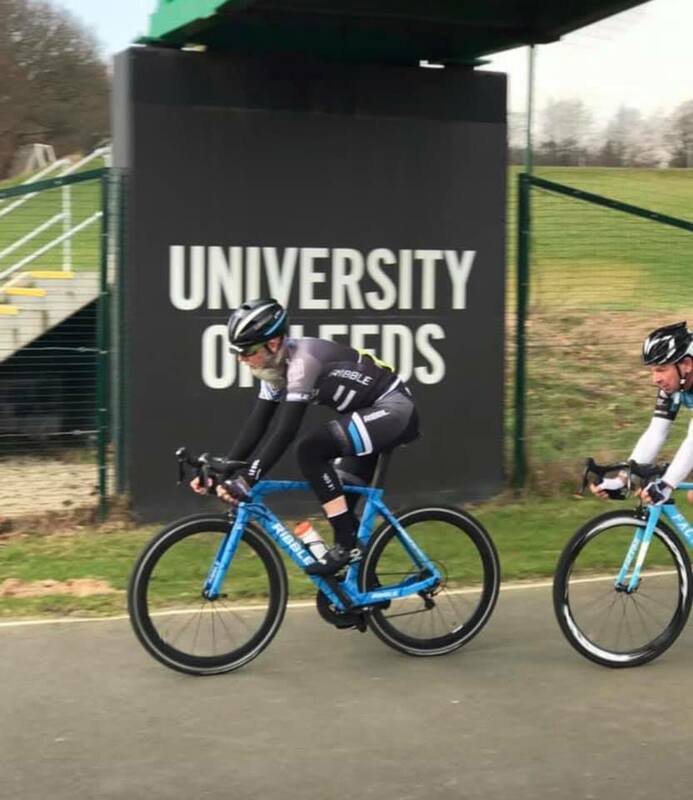 For north east fans though the highlight of the day was seeing one of our own, Ben Hetherington finishing an incredible 6th after being in the break all day with some of the best riders in the country. 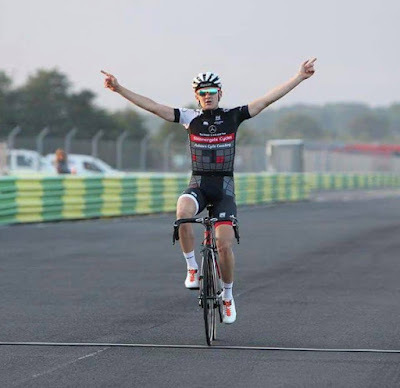 On the Tuesday evening after his epic ride at the nationals Ben had recovered sufficiently to race in our local TLI summer series at the Croft motor racing circuit Croftcycleracing. Above warming up with a another good friend, training partner and team mate in the Ribble Development Squad Jason Hurt enjoying first hand Ben's account of over 100 miles in the break with some of the UK's top professionals and valiant attack during the run in to the finish. Above another picture of Ben at the Croft circuit, (taken by another mate Dean Reeve) this time with his hands in the air taking a solo victory riding for our team before we became Ribble Pro Cycling. 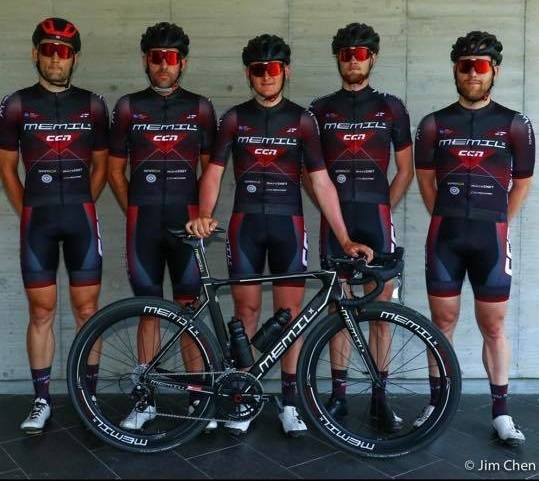 I have previously posted here on the evolution of the team and its development over the last six years, a process which continues into 2019 with the step up to UCI level. Ben flourished during his three seasons with the team and won a lot of bike races during that time. 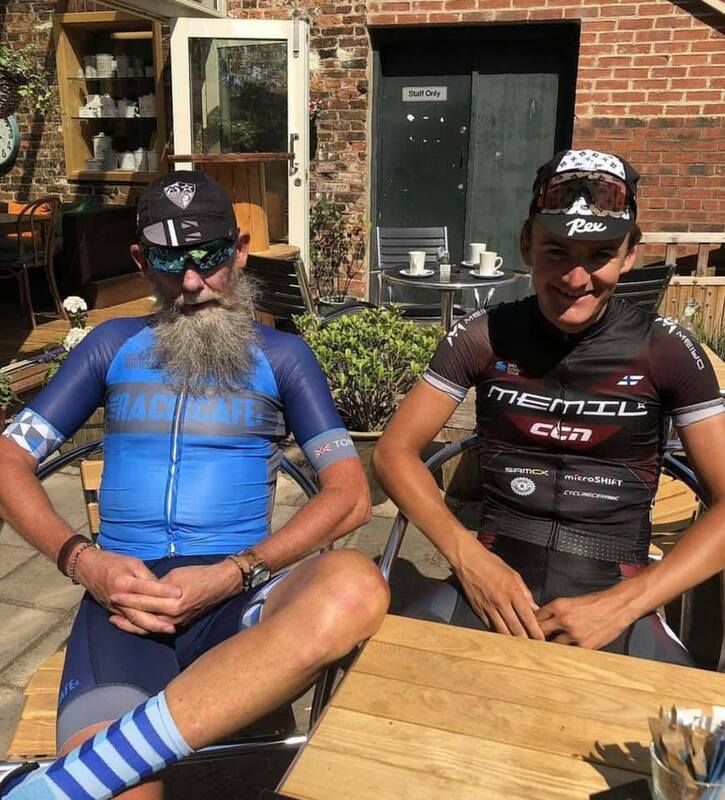 I usually catch up with Ben a couple of times during his fleeting visits back to the UK, above enjoying the sun at one of our favourite cafes. I think on this occasion Ben had just returned from the ten day Tour de Maroc where the team had an excellent tour and took a stage win. 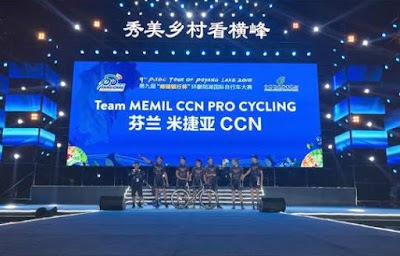 Above - The Memil/CCN boys are presented to the crowd (below) at the opening ceremony of the eleven stage Tour of Poyang Lake in China. 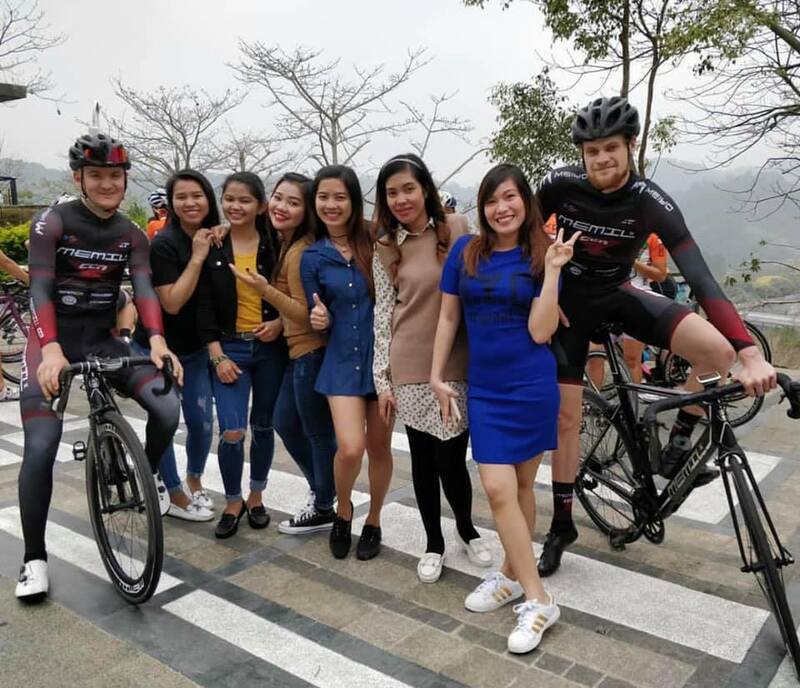 Memil/CCN Pro Cycling are a UCI Asia Continental team whose title sponsors are Swedish cycling brand Memil and CCN a Hong Kong based sports clothing manufacturer. Equally huge crowds watched the opening ceremony prior to the prestigious Tour of Qinghai Lake above Ben gives the fans a wave as he is introduced. 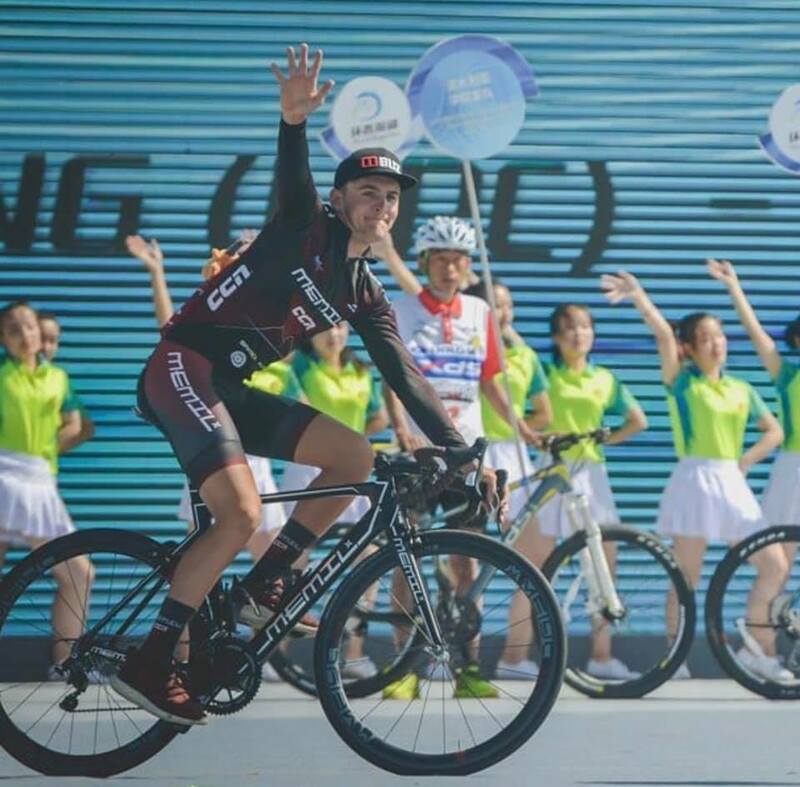 Also waving at Qinghai Lake Jacob Tipper as he sprints to victory on stage eleven. 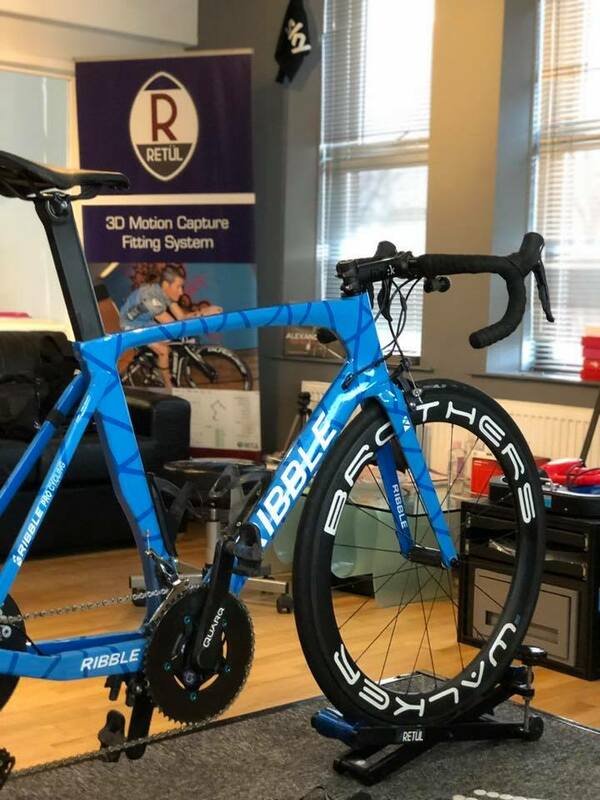 After a very successful season experiencing international competition with Memil/CCN Jacob is returning to race a predominantly European programme with Ribble Pro Cycling in 2019. 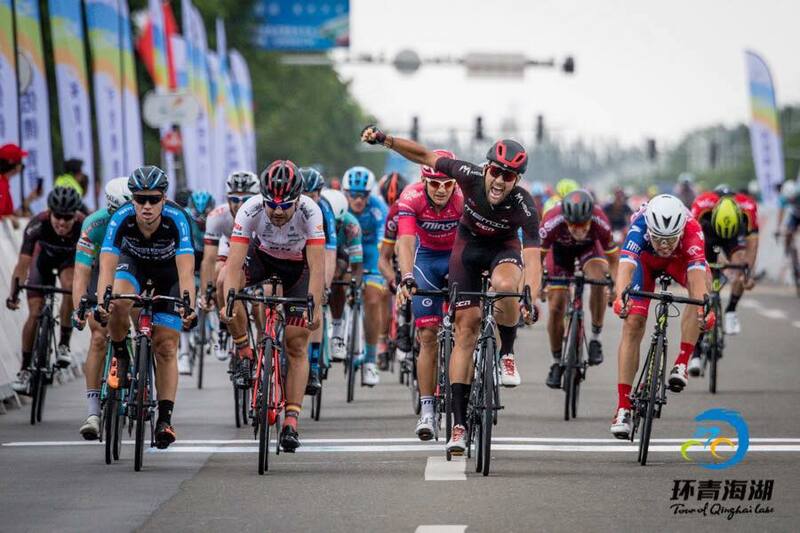 Ben on the front working for the team at the Tour of Qinghai Lake. 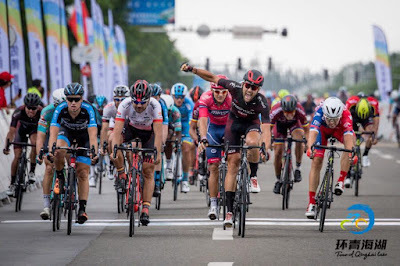 This year was the 17th edition of the 2.HC race which is part of the UCI Asia Tour, click here ToQL-FB for some great images and videos from this year including one with the highlights of Stage 11 which the team won ToQLStge11 watching these video gives you a real sense of how massive these races are. 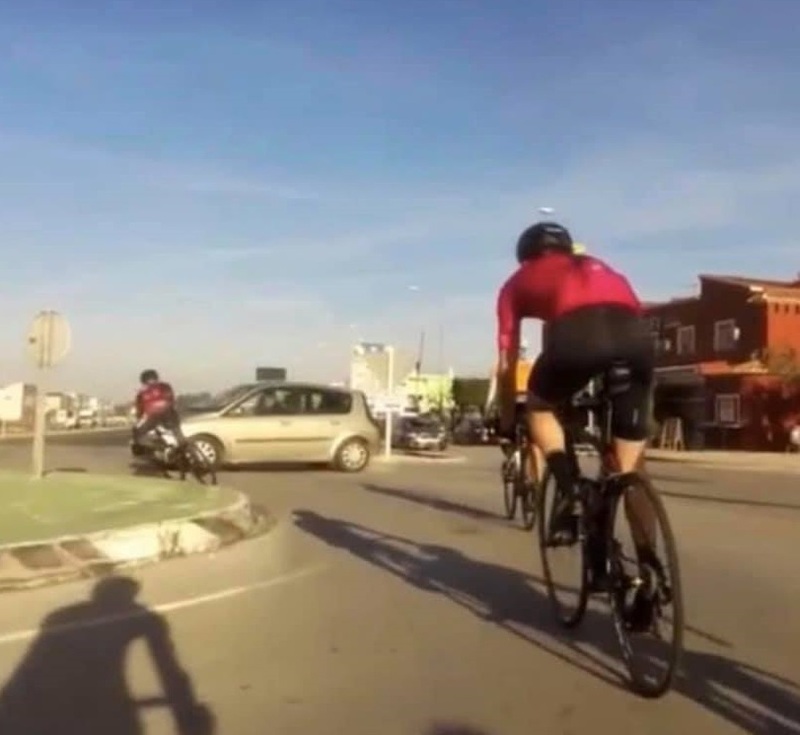 This time off the front and a typically aggressive move animating the race. 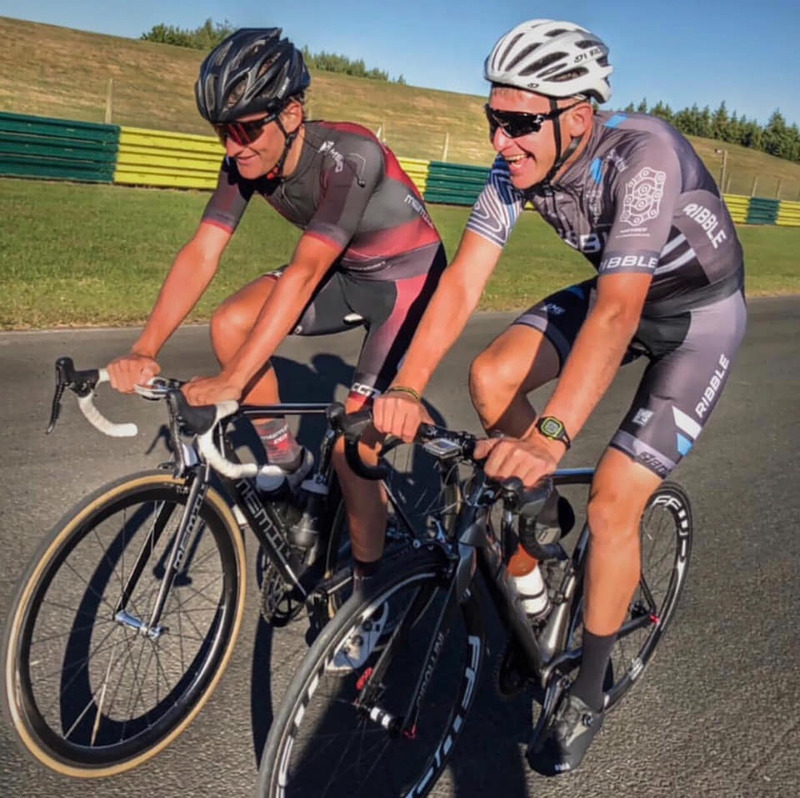 Ben is a rider who is always keen to get in a break but he is also a bit of a specialist at the lone attack and if he gets away his time trialling strength makes him extremely difficult to bring back. Yes I am pretty sure the Memil boys enjoy racing in China.The team's race calendar for 2019 has yet to be fully finalised but it is likely to start with the tours of the Phillipines, Taiwan and Langkawi along with another trip to the Tour de Moroc. Following the Tour of Norway in May Memil/CCN will be returning to China for a series of major stage races likely to include the Tour of Hainan. Ben is currently in Spain preparing for the 2019 season but unfortunately his training block has not got off to a great start as earlier this week he was struck by a car during a training ride. As you can see from this video collision in which Ben is at the front of the line (obviously) it was a nasty accident and although his bike was completely destroyed Ben suffered relatively minor injuries. 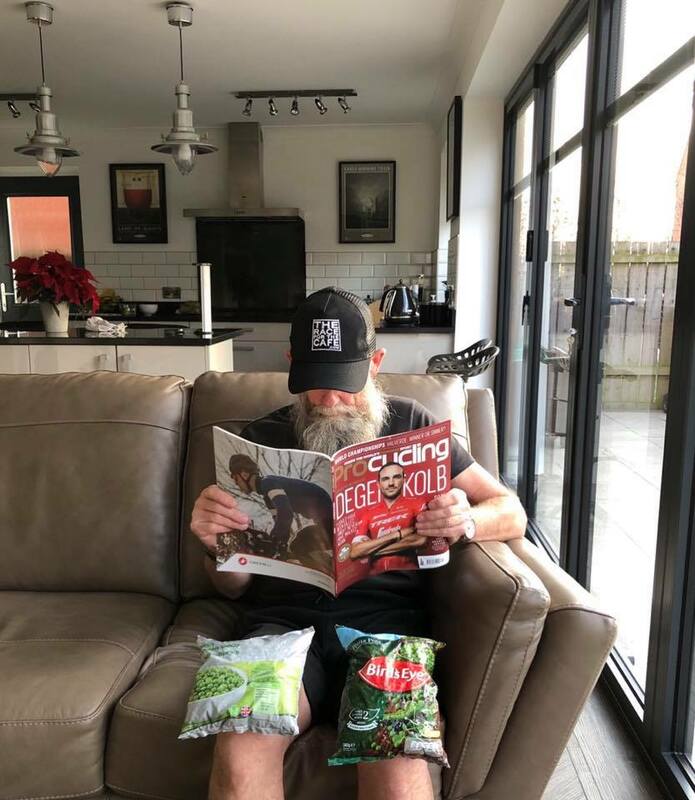 A bit of a setback for sure, but thanks to tremendous support from friends at Blanca Bikes Ben is already back training, although feeling a bit sore. You can keep up to date with Ben's training and 2019 racing season on his blog Trying To Make My Dream Reality - looks to me like he already has! Next post will be in 2019 have a great Christmas and thanks for reading. Behind the scenes at the worlds best bike fit. As regular blog readers will know I do my bike racing with RibbleProCycling and while I now only compete in LVRC and TLI age related events what Ribble Pro Cycling is really about is racing at the very highest level both domestically and internationally. The team have been top of the UK points rankings for the last two seasons and are stepping up to UCI level in 2019. To ensure their continued success the team are continually searching for innovative companies to work with and a number of new partners have already been announced for 2019, one of them being Physiohaus. 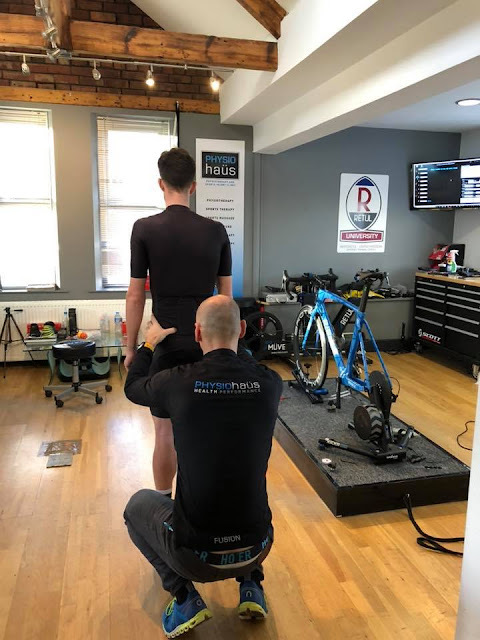 So when Jack (team rider/coach/training partner/son) mentioned that he had an appointment for a bike fit I decided to tag along as knew it would be an interesting day out and maybe make a decent blog post. 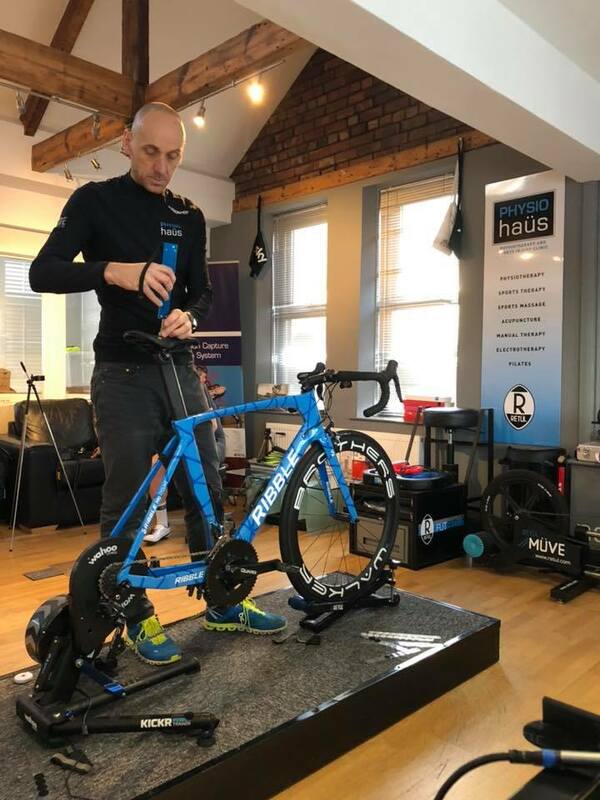 The fit was at Physiohaus HQ in Jesmond, Newcastle and was to be done by John Dennis who is a genuine expert in this field and arguably one of the best bike fitters in the world. 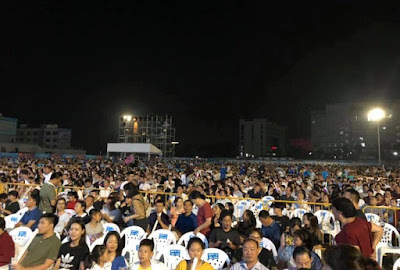 The whole process was scheduled to take approx two and half hours and the first stage was a pre-fit physical examination. 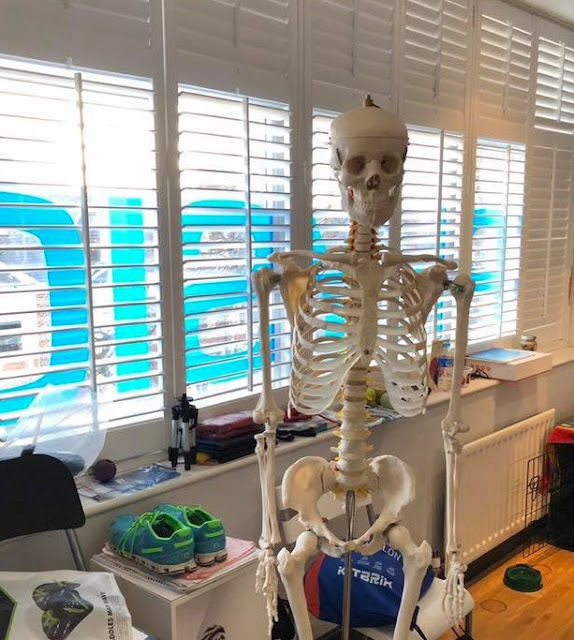 John's expert physiotherapists eye assessed Jack's physical limitations, imbalances, previous injuries and aches and pains, as well as discussing current position and aims and goals for the coming season. John has twenty seven years experience as a Chartered Physiotherapist and he has done at lot of work with elite athletes, having previously been Lead Physio for both Badminton England and British Triathlon. He has also plied his trade as part of Team GB at World Championships, the Commonwealth Games and the Olympics. 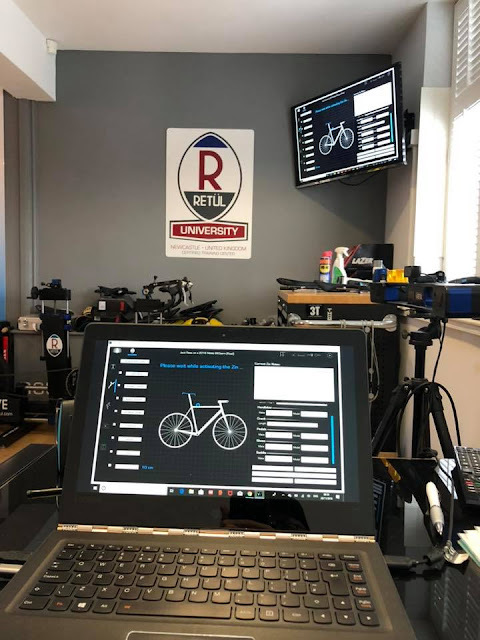 Recognised as being an expert on bio-mechanics John has trained bike fitters all over the world and if someone is using the Retul system there is a good chance that they will have done a course with John or a member of his team, so this is a guy who knows his stuff for sure. Above yours truly in action capturing the all important blog content ... not really I am just pretending. I have literally no idea how to use that camera, not a clue I just use my phone, for this shot on a tripod with a remote control clicker thingy, I bought on Ebay. 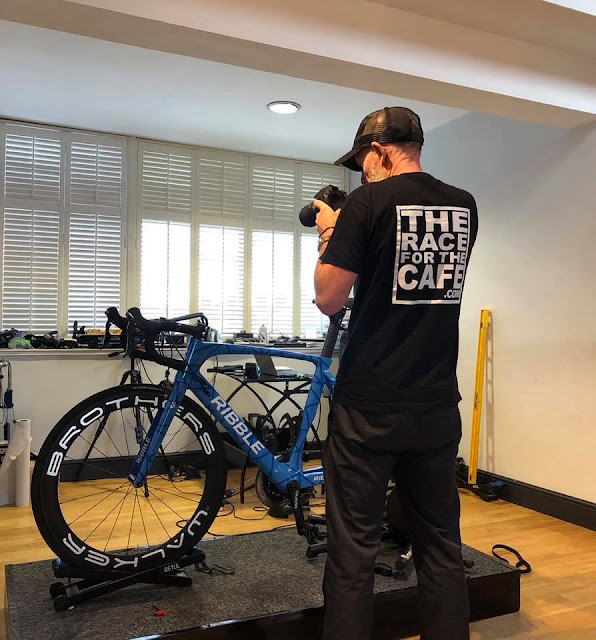 You might think that describing John as arguably the worlds best bike fitter is a bit of bold statement but if you watched him work and heard his experience I'm pretty sure you would agree. He has been using Retul technology since 2009 and he has fitted riders from, Team Sky, Orica, MTN Qhubeka, Europe Car and Radioshack as well as pro triathletes from the ITU and Ironman circuits. 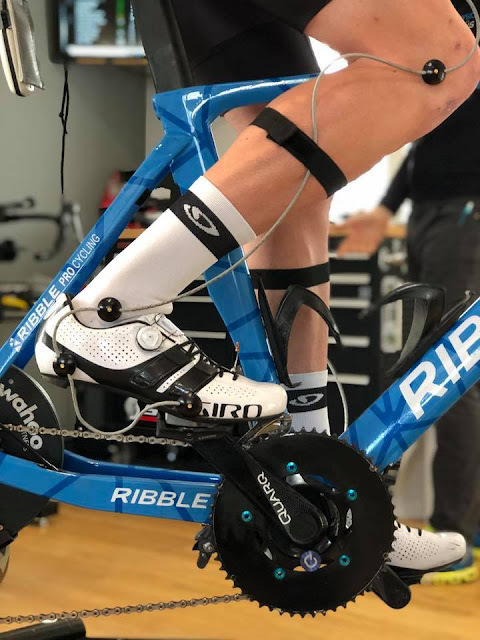 Above on the saddle and hanging from it is something called the Gebiomized saddle pressure mapping system, bit of a mouthful but a really clever bit of kit. It's used to accurately assess how and where the rider sits on his saddle. 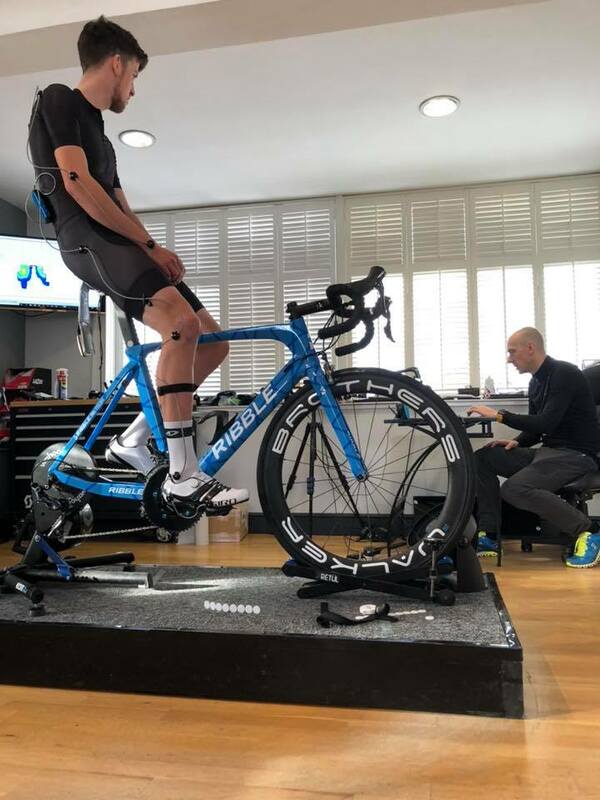 This was the first stage of the fit and seemed like a sensible place to start, not only as an important element of the bike fit process but also in relation to saddle comfort issues and choice of the most suitable saddle. The system is comprised of a thin flexible film with sixty four sensors embedded in it. The data is wirelessly transmitted to the screen and a pressure map is displayed showing weight distribution across the saddle in a colour scale, both static and while pedalling under load. Jack has noticed that he sometimes gets more wear on one side of his cycling shorts than the other and the reason for this was pretty clear from the pressure map. Physiohaus use the Retul 3D motion capture system to assess the riders biomechanical profile, eight LED markers are positioned at key points and the motion capture system uses them to collect real time, three dimensional data from every pedal stroke. 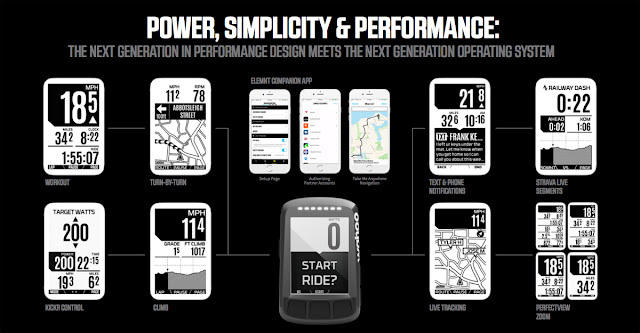 This facility to stream data in real time while the rider is actually pedalling under load is a big advantage as the riders strengths weakness and areas for improvement can not only be identified very quickly but can be viewed on the screen in real time - pretty impressive. 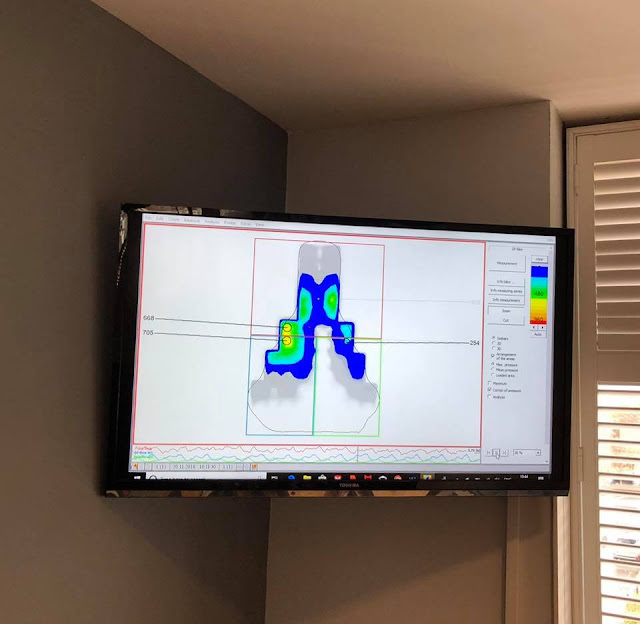 All of the measurements were taken from both sides to ensure that every degree of movement and millimeter of distance was captured, providing solid data to compliment the other stages of the fit process and to support the fit recommendations. The human body is rarely perfectly symmetrical and when you are perched on something that is symmetrical ... like a bike, these differences become more evident. The ability to expertly interpret the data is crucial to achieving the aim of the bike fit which is to arrive at an optimal position and a balance between left and right sides. This real time data is converted by the Retul software in to numbers that John then used to dial in Jack's perfect position. This was then converted in to a digital map of the final bike set up and riding position. All the information from the session then goes in to a final fit report to have for reference later. Jack getting a summary of the results and some recommendations from John, which boiled down to moving his saddle up and forward and due to having a long back changing his stem to get longer and lower. Cyclists in general are often meticulous in their attention to detail particularly when it comes to equipment choices and training programmes but can sometimes be guilty of overlooking the fundamentals in other areas, a bike fit by an expert like John can optimise riding position not only to maximise performance but also to help you get more comfortable and prevent aches and pains and potential injuries. As the name suggests Physiohaus are not just about bike fitting and they have a highly qualified team of five physiotherapists and two sports therapists in Jesmond PhysioTeam although I'm not sure even they could do much for this fella who was hanging about all morning and starting to freak me out to be honest. 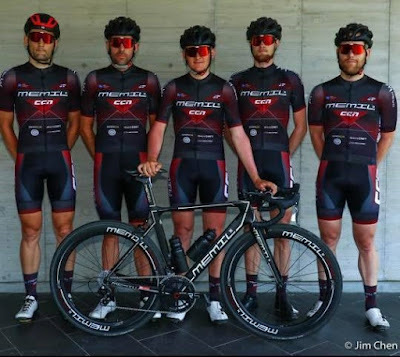 Next time a feature on my mate Ben a pro for UCI Continental team MemilCCNProcycling with race pics from all over the world ... and various other places :-) its going to be a good one ! Training with power - no soft tapping this winter. To start this week's post on my first experience of training with power first a very brief summary of my 2018 season. It started really well and I was encouraged by my early results, always near the front and finishing in the top ten. In the middle part of the season the races seemed to get harder and my results got worse, too much racing, too much training and too much travelling - yep I had definitely overdone it, over trained? under recovered ? whatever it was, I was cooked. With hindsight thirteen races in May was maybe a little bit too ambitious, lesson learned. 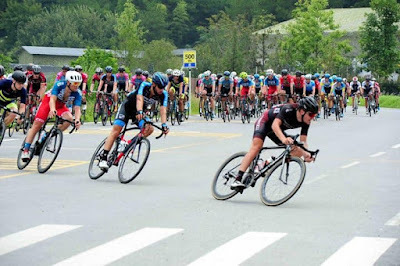 MayTourLVRC In the last third of the season after a period of recovery I felt back on form but the races were not going that well and usually under very similar circumstances. Heading out, ready to press harder on the pedals. Often in races I found that I was under pressure and sometimes lost contact when the road dragged up for more than a couple of minutes. I was just not strong enough compared to the best guys in my age category, especially towards the end of a race. AgeGroupRacing So one of the things I need to do is get better at this type of effort. There is an old adage that says if you keep doing the same things you will keep getting the same results ... or words to that effect, and after reflecting on my race season I decided that I needed to change the way I train to try and improve on the efforts that were letting me down in races. Having talked to Jack (my son/coach) at length on how to approach my winter training we agreed that I needed to start using a power meter and do my winter training a bit differently this time round. You can read more about training with Jack, here Polarisedtraining and here HowElitesTrain. Jack put me in touch with the nice folks at Pinpoint Consumer Electronics who very kindly supplied me with a 4iiiiuk.com Precision power meter and a Viiiiva heart rate monitor to go with it. I am trying to be realistic in terms of the benefit I can get from training with a power meter and I am not really expecting to find significant number of extra watts over the winter. 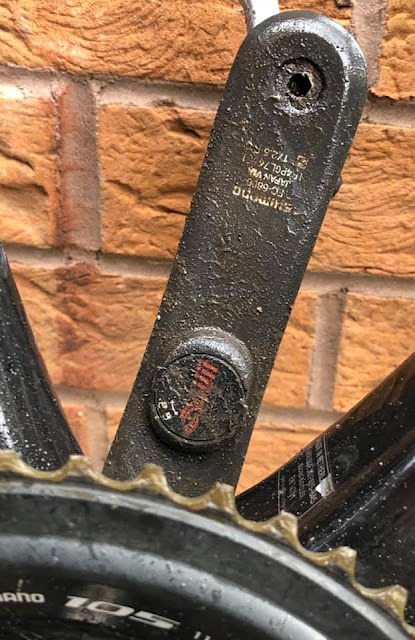 In fact one of the reasons that I haven't used a power meter in the past was that I felt that as I am sixty three this month I would potentially just be gathering data on my inevitable decline - not particularly motivating ! The 4iiiiuk.com Precision was really easy to install and set up as it comes already fitted to a new left side crank arm, old one off, new one on, wake it up by turning the pedals backwards and it pairs to your head unit. Position the cranks arms vertically to calibrate and that's it - sorted, it took me fifteen minutes max and as I am normally absolutely useless at stuff like this I was well pleased. A detailed review on the Precision power meter by CyclingWeekly4iiii here. On my first ride I immediately noticed how sensitive the Precision 4iiiiuk.com power meter was to pressure on the pedals - I know that's blindingly obvious but I was still surprised ! If you ease of on the pedals the power meter instantly tells you and the second you stop pedalling - BIG FAT ZERO. 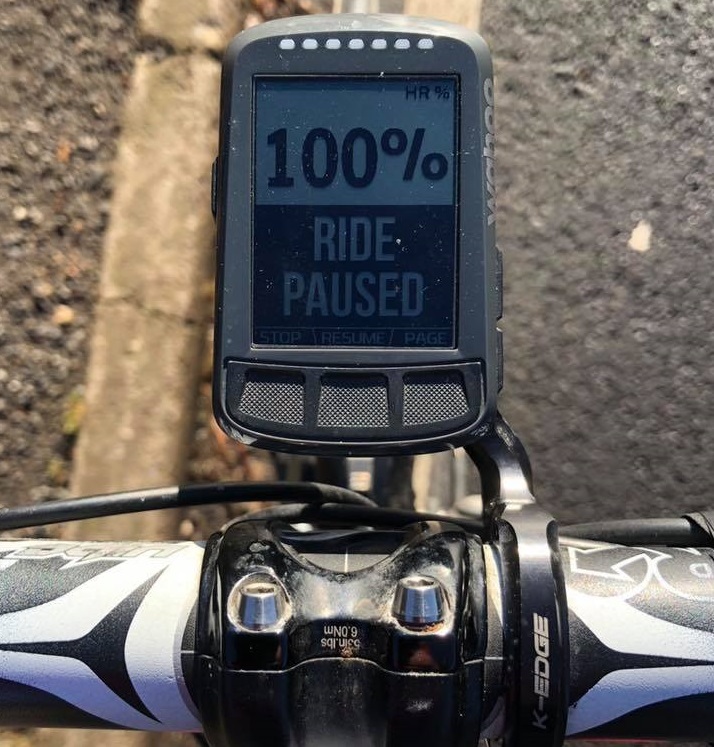 This very simple realisation quickly changed the way I ride, no more free wheeling after cresting a slight incline, no more soft tapping when riding in a tail wind, no more easy pedalling on the wheel to keep the beard out of the wind, the power meter was a game changer almost immediately. Only three weeks in and I've noticed a difference already. Somebody said to me that using a power meter makes you a lot more honest about how hard you are actually training and yes I have probably been kidding myself in to thinking I was doing everything I could. 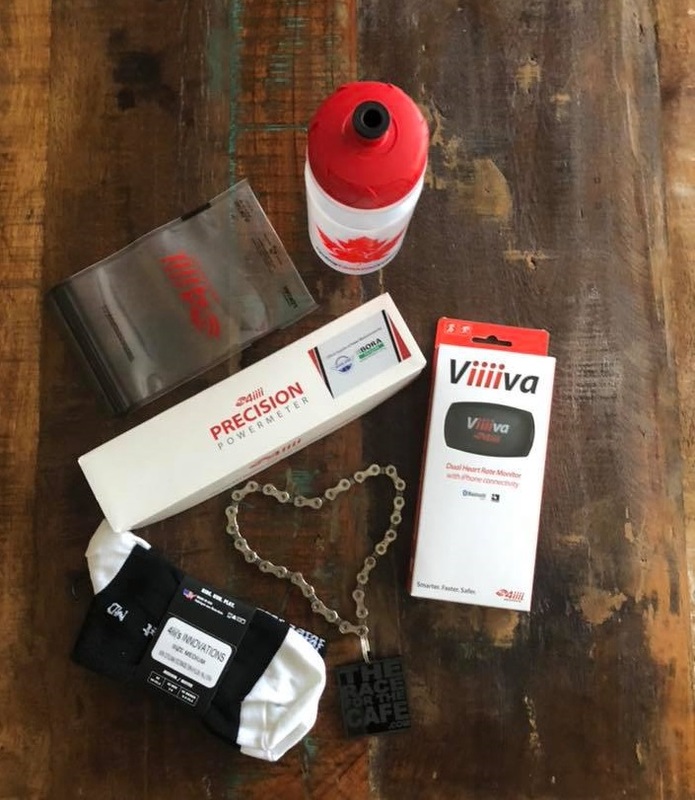 So my training is going to be much more structured from now on and having already changed the way I ride my training time will be used much more effectively. To be clear though I will still be soft tapping to my favourite cafe The-Mockingbird-Deli-Yarm two or three days a week. To set my 4iiii power training zones three consecutive days of testing started fairly appropriately with five minute efforts. The protocol was a progressive warm up followed by three efforts with thirty minutes of recovery between. This testing was done up a long drag, very similar to the sort that have been causing me problems in races. The efforts were really hard and I didn't enjoy them at all, the cool down to the cafe was OK though. The second day of testing was the twenty minute effort done on our local time trial course out and back between two roundabouts in a crosswind, hard but I think I paced it just about right and was on my maximum heart rate for the last 2-3 minutes. Day three (above) required a long straight road with an even gradient, light cross-wind and legs feeling good ... well er no actually they didn't, but I did the test anyway, which was 3 x 1 minute efforts with 10 minutes recovery between, a lot harder than it sounds. I got everything out on the final one minute effort, and I had my finger hovering over the lap button for the last three seconds desperate for it to be over, I had so much fun doing these tests ... not. But, I hear you ask, if I don't expect to find much in the way of a power increase, then how do I expect to improve my 5 minute effort ? Well simply by doing lots of 5 minute efforts up longish drags at a specific power output over the next few months, and the power meter will enable me to do that accurately. What I hope will happen is that simply by doing them every week all winter at a specific wattage, I will begin to get better at them. In addition, I will have an accurate record of every effort I have done, so when it comes to my 2019 races I will know exactly what I can do for a given period of time. Hopefully I will have also improved my ability to repeat these efforts when fatigued towards the end of races, that's the theory anyway. So before I finish and in the spirit of transparency here's what you really want to know, my test numbers. My 1 min effort was 370 watts, 5 min effort 235 watts and my 20 min effort 212 watts and by multiplying my 20 minute power by .95 I now know that my functional threshold power (FTP) the average power that I should be able to sustain for an hour is 201 watts and that feels about right. 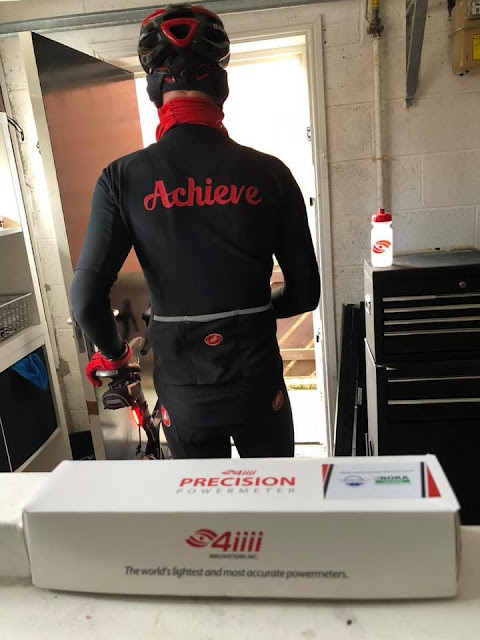 Three weeks in to power training and I have already made a slight improvement on my 5 minute effort, its going to be a hard winter for sure and my old knees are starting to complain already but I am happy with our plan and more than happy with the 4iiii.com Precision power meter.